Specialized readout mode for achieving very fast frame rates (sub-millisecond exposures) from ‘standard’ cameras. Continuous rapid spooling of images/spectra to hard disk. User selectable cropped sensor size – highly intuitive software definition. Standard readout mode for iXon3 EMCCD Camera, Newton (CCD and EMCCD) and iKon (CCD) cameras. If an experiment demands fast temporal resolution, but cannot be constrained by the maximum storage size of the sensor (as is the case for ‘Fast Kinetics Mode’ of readout), then it is possible to readout some Andor EMCCD or CCD camera families in a special user-selectable ‘Cropped Sensor Mode’. In this mode, the user defines a ‘sub-array’ size from within the full image sensor area, such that it encompasses the region of the image where change is rapidly occurring (e.g. a ‘calcium spark’ within a cell). The sensor subsequently “imagines” that it is of this smaller defined array size, achieved through software executing special readout patterns, and reads out at a proportionally faster frame rate. The smaller the defined array size, the faster the frame rate achievable. In order to use Cropped Sensor mode, one has to ensure that no light is falling on the light sensitive area outside of the defined region. Any light collected outside the cropped area could corrupt the images which were acquired in this mode.Cropped Sensor Mode has the end result of achieving a much faster frame rate than that obtainable in a conventional ‘sub-array’ / ROI readout (during which we would still have to vertically shift the unwanted rows). The frame rate increase is achieved by not reading out (i.e. discarding) the unwanted pixels. Figure 1. Cropped Sensor Mode. The active imaging area of the sensor is defined in a way that only a small section of the entire chip is used for imaging. The remaining area has to be optically masked to prevent light leakage and charge spill-over that would compromise the signal from the imaging area. By cropping the sensor one achieves faster frame rates because the temporal resolution will be dictated by the time it requires to read out small section of the sensor. Cropped sensor mode is ideally suited to a number of challenging applications across many diverse fields of research. In terms of technology matches, cropped sensor is well suited to rapid applications of EMCCD cameras. The fundamental advantage and a distinct feature of EMCCD technology is its ability to virtually eliminate the camera readout noise detection limit at any readout speed. This allows EMCCD detectors to be successfully used for applications where raw sensitivity and exposure time requirements ultimately prevent the use of conventional CCD systems. In biological imaging Cropped Sensor Mode can be successfully used to enhance performance and throughput in super-resolution ‘nanoscopic’ applications including STORM and PALMIRA. Imaging frame rates exceeding 1000 / s can be achieved with sufficiently small crop area. Series of measurements done on Andor iXon+ 885 EMCCD camera have demonstrated that Cropped Sensor Mode in conjunction with binning has pushed the speed beyond 4000 frames per second. Table 1: Imaging frame rate potential of Andor iXon3 885 EMCCD camera under conditions of Cropped Sensor Mode readout. Significant improvement in image resolution of E.coli bacterial cell has been demonstrated by Alexander Egner in his paper describing rapid PALM imaging using high-speed Andor iXon3 860 EMCCD (Figure 2). Table 2: Spectral rate potential of Andor Newton EMCCD cameras under conditions of Cropped Sensor Mode readout, vs ‘standard’ full vertical binned rates. The Andor Newton spectroscopic EMCCD cameras offers the ability to allow the sensor to be virtually reduced in effective size to a narrow format requiring fewer vertical row shifts to acquire a given spectrum. Figure 3 illustrates such an example of the use of Cropped Sensor Mode. A spectrum has been aligned along the bottom rows of the sensor so that all the signal falls in the bottom twenty rows and no signal falls on the rest of the sensor. In the acquisition process the EMCCD is treated as one of just 20 rows in height which are read out in FVB mode, i.e. the 20 rows are integrated in the readout register before reading out takes place. Figure 3: Cropped sensor spectral acquisition mode in the Andor Newton. The upper panel show an image cropped to use only its bottoms 20 pixels as imaging area.Typical spectrum is shown in the middle with a 3-D rendering of the spectrum in 20 pixel-high dimension below. 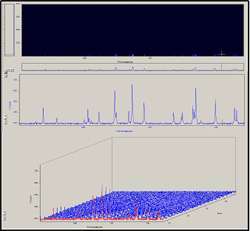 3D view of a kinetic series of spectra taken with crop mode is often used to illustrate temporal changes of an evolving event. There is also potential to use cropped EMCCDs for multi-spectral fluorescence confocal scanning, as an alternative to the arrays of PMTs that have traditionally been used in this approach. The > 90% quantum efficiency of the back-illuminated sensor, single photon sensitivity, array architecture and rapid pixel readout speed can be exploited to markedly improve this approach. 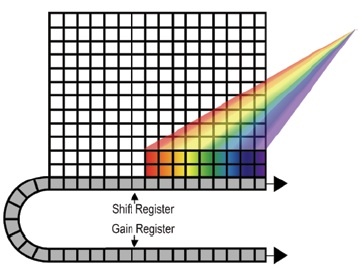 The laser dwell-time should be set to coincide with the time to expose and read-out a short row of approx 32 pixels - sufficient spectral channels to yield effective un-mixing of several known emitting dyes, resulting in a data cube of 512 x 512 x 32 (spectral) taking less than 1 second to generate. There is a clear sensitivity advantage of EMCCD pixels over the usually employed PMT-technology, which is circa 5-fold in the blue-green and up to tenfold in the red.